I am sure we are eagerly awaiting the restart of the Barclays Premier League on August 18th, not to mention watching United playing in their pre-season tour of South Africa, Asia, and Norway. However, until then, we have to make do with whatever football we can, and what better way than keeping an eye on the United stars currently taking part in Euro 2012 over in Poland and Ukraine. I’d like to start with arguably our best player, certainly our highest paid, Wayne Rooney. Unfortunately for Rooney, he’s only had the chance to play in 1 game in the tournament due to his 2 match suspension . But when he returned to the England line up on Tuesday against Ukraine, he did so with a rusty performance, but typically capped by the winning and only goal of the game. I’m sure he will be almost certain to start the Quarter Final clash with Italy on Sunday. Despite finishing the season for United in a good spell of form, Young’s performances at the tournament certainly have not been what we have grown used to seeing at points throughout the season. Although England’s style of play throughout the tournament haven’t been suitable to the way that Ashley Young has grown used to playing at United. Whilst he has an excellent delivery on him from wide positions, England’s defensive style has meant there are few bodies supporting in the attacks. We’ve all witnessed a great season from Danny Welbeck, and Roy Hodgson must have also admired his performances, as he has started all 3 of England’s Euro 2012 games so far. It’s been a difficult tournament for Danny Welbeck due to England’s defensive style of play, but he has managed to aquit himself magnificently, earning great praise in the process. The highlight of the tournament for Danny so far was his sublime goal which he scored in the dying moments of the game against Sweden. When Walcott’s cross came in slightly behind him, he quickly adjusted his body and with his back to goal, slotted home excellently. Hopefully Roy Hodgson will keep his faith with Welbeck for the Quarter final for him to link up with Rooney again. Sadly for our young defender, he hasn’t managed to play any part in the tournament as of yet. As we know, naturally he is a centre-back, but throughout the season he has played mainly at right back and as a defensive midfielder on a few occasions. In fact, of his 5 England caps, none have been in his preferred position at the heart of the defence. 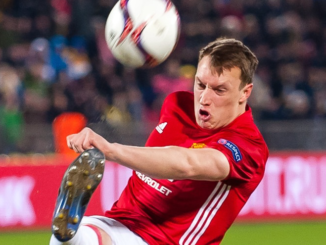 I’m sure Jones will be the first choice RB should Johnson get injured or fatigued. Patrice has been the Captain of the United side for the majority of the season, but at Euro 2012, he has only 1 appearance to his name which came in the first game against England. He played well when going forward, and defensively he was sound. However He has since lost his place in Laurent Blanc’s side to the Man City left back, Gael Clichy. The only United player whose side didnt make it out of the group, but his Denmark side performed admirably in the ‘Group of Death’ against Germany, Portugal and the Netherlands. Sadly, Anders could claim no credit for his sides performances as he was was an unused substitute in all 3 of Denmark’s group games. I’m sure his recent injury problems were the cause of Lindegaard not being Denmarks #1. I fully expect him to use the summer to get fully fit and we hope to see him back in a United shirt on the pre season tour. Ideally, I would love to see a United player win the tournament, so a Portugal v England final would be really nice, but the odds of that happening are fairly steep, considering the nations that stand in the way. But failing that, lets just enjoy having football on the TV and in the newspapers. Enjoy.